Crowns: How to Achieve All Natural Aesthetic Outcomes In Part I of “Are All Crowns the Same?”, we discussed the differences in the quality of the crowns. In Part II, we are comparing the aesthetic results of milled crowns, crowns fabricated in a commercial laboratory, and custom crowns fabricated by an in-house technician as we do at Prosthetic Dentistry of Washington, D.C.
To begin with, milled crowns (on a CAD/CAM milling machine) are fabricated from a “library” of usual and customary crowns. As such, they are a stock image that is put over the digital image of your prepared tooth and made to fit within that space. Since there are hundreds of types of teeth, the anatomic form is not an exact match to your other teeth. These crowns are frequently too opaque or too gray and have a shape that is not always a match to your own natural tooth anatomy. Crowns fabricated in a commercial laboratory, while more custom, can also fall short in form, color, and/or translucency. 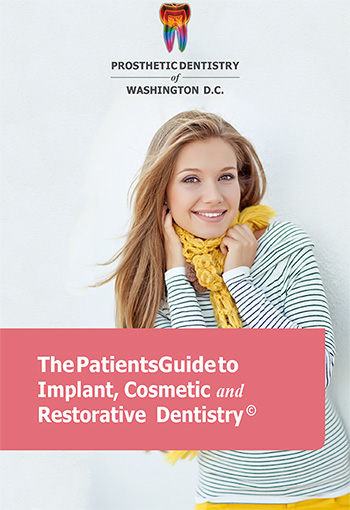 In-House Dental Lab: Prosthetic Dentistry of Washington, D.C.
To obtain the most natural aesthetics, our in-house technician evaluates the proper shade, translucency, and anatomic form of our patient’s other teeth (Figs 1 and 2). First, we use an extended shade guide (Fig. 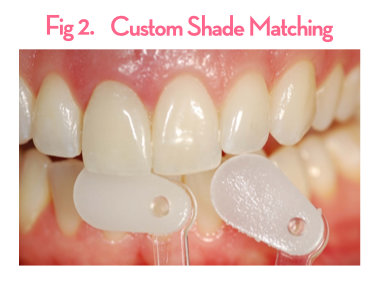 1) that allows us to develop the right shade at each level of porcelain. 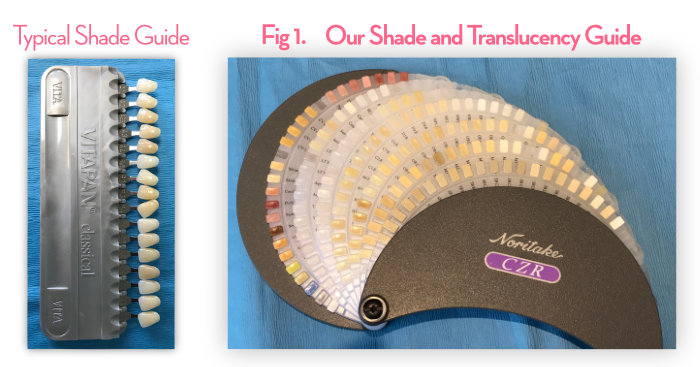 After all, if teeth have internal colorations and different translucencies at each internal level, then we need to take a shade for each level. For over 30 years, we have worked with our in-house technician to provide internal colorations and custom staining to create all-natural looking crowns.